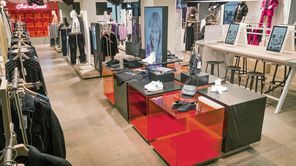 A trend floor with showroom appeal, feel-good fitting rooms and simple payment via an app – these are just a few of the highlights that await shoppers in bonprix’s new Hamburg-based pilot store. 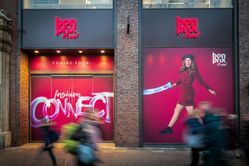 In keeping with the “fashion connect” motto, the store unites all the advantages of high street retail with the comfort of online shopping. And at the heart of everything: the customer’s own requirements. The result is an entirely unique, digitally driven shopping experience. At today’s #FASHIONTECH BERLIN and for the first time, bonprix reveales more details about its experimental concept. The pilot store in Hamburg’s prominent Moenckebergstrasse is set to open on 14 February. Until then, the brand’s own microsite provides shoppers with a sneak preview of what to expect. 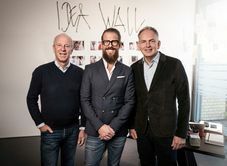 The “fashion connect” concept was developed as part of an innovation project in close collaboration with leading experts from the Otto Group. Back in October, bonprix announced a radical new retail concept promising a seamless shopping experience with real added value. 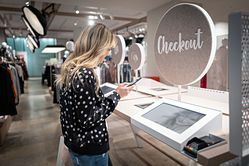 Pioneering technical innovation has done away with the weaknesses of traditional retail, such as untidy shelves, cluttered floor areas, dingy fitting rooms and long queues at the checkout. 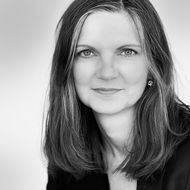 The international fashion brand is now focusing consistently on its customers, digitalisation and its own adaptability. “We know what appeals to our customers and this way we can present them with the latest trends in a comfortable and inspiring environment,” explained Rien Jansen, Managing Director and Head of Purchasing, Marketing & Retail at bonprix Handelsgesellschaft. To ensure everything runs smoothly the customer’s entire visit is app-assisted. At every stage bonprix uses technical innovation – from checking in on arrival, to selecting and trying on their favourite pieces, all the way through to easy payment options. “We’ve revolutionised shopping so it’s a choice, not a chore,” Jansen continues. At the heart of the pilot store is bonprix’s enhanced app. 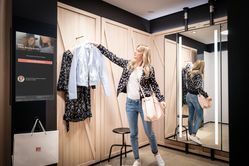 It acts as a personal shopping assistant, guiding the customer through their visit and designed to be used as an in-store remote control. After checking in, the customer can scan products and select the correct size. Items are then added to a virtual shopping bag so they can be picked and hung in a fitting room ready to try on. Real life fashion assistants are also on hand to help newbies use the app, and offer help and advice in the fitting room area. “Whether we use them for messaging or for online shopping, our phones are omnipresent these days,” says Markus Fuchshofen. “And that’s exactly why we’ve afforded them a central role in our pilot store.” As Managing Director and Head of E-Commerce, Sales Germany & Brand, Fuchshofen has helped transform bonprix into one of Germany’s most profitable online shops. He now brings his expertise to the new project. “The manner in which we have consistently digitalised the shopping process remains unique in the retail sector,” he continues. One highlight of bonprix’s new pilot store is the trend floor. Gone are the days of untidy shelves where customers are left rummaging for the right size. Here, every single garment and accessory is showcased as part of bonprix’s inspiring style worlds. As well as allowing a clear overview, this “one item presentation” lends the store a generous showroom character where customers can browse the latest looks in a relaxed atmosphere. 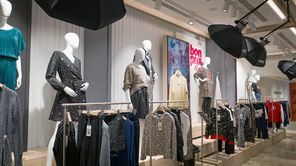 The “fashion connect” concept is aimed at style-savvy women aged 30+ and features popular pieces from bonprix’s younger, more on-trend brands Bodyflirt and Rainbow. 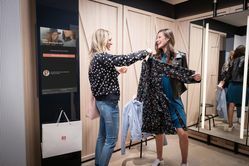 To make trying on clothes more fun bonprix has also developed a brand new fitting room experience. After items have been scanned, they are picked and hung in a fitting room ready for the customer. Meanwhile, shoppers can relax with a refreshing drink at one of two in-store fashion bars. Once everything has been prepared, the customer is invited to their personal fitting room. As well as being more generously sized, the rooms are well ventilated and offer a choice of four mood lighting settings. A large screen displays the contents of the bonprix app and shows the next steps. If the customer needs a different size, they can order it directly to their fitting room. And anyone requiring help or advice can summon a fashion assistant at the touch of a button. As the customer is free to select their preferred method of payment, there are no long queues either. 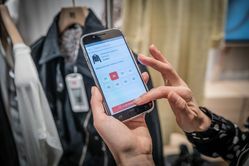 Once the customer leaves the fitting room with the items they want, the app uses state-of-the-art RFID technology to automatically update their shopping bag. Shoppers can use the app to pay by PayPal, or head to the check-out with a debit card, credit card or cash. There’s no need to wait to have any security tags removed either. We're happy to send you all the latest bonprix news. As an internationally successful fashion retailer, bonprix reaches more than 35 million customers in 30 countries. The company, which is part of the Otto Group and is based in Hamburg, was established in 1986 and now employs around 3,900 people worldwide. In fiscal 2018/2019 (February 28), bonprix Handelsgesellschaft mbH generated sales of EUR 1.57 billion, making it one of the Otto Group’s best-performing businesses. 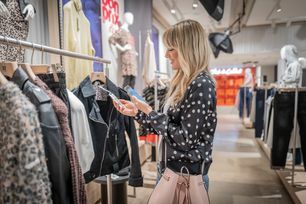 At bonprix, customers can enjoy fashion and shopping on all channels – online, via the catalog or at one of its fashion stores. At approximately 85 percent, the lion’s share of the company’s sales comes from e-commerce. In Germany, www.bonprix.de is one of the ten highest-grossing online shops and the No. 3 for fashion. * Selling only its own brands bpc, bpc selection, BODYFLIRT, RAINBOW and John Baner, bonprix offers customers outstanding value for money. Its range includes clothing for men, women and children, accessories, as well as textiles and articles for the home.